Buy directly from Rosaleen by clicking the Buy Now button below. A really worthwhile read for only £10. "An essential read that will make you laugh and cry, be angry and proud with every turn of the page." Rosaleen is the only Thalidomide impaired person to have written her autobiography, and interspersed it with a definitive factual history of the drug Thalidomide from its early years of manufacture in Nazi Germany, and then into the new millennium. 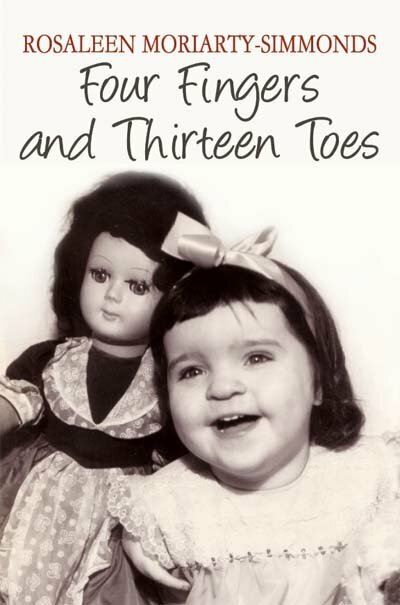 Described as an essential read “that will make you laugh and cry, be angry and proud with every turn of the page” Four Fingers and Thirteen Toes tells the story of how Rosie overcame horrendous injuries to her physical being as a result of her mother being prescribed the “so-called” wonder drug that became known the world over as Thalidomide. The drug left Rosie with four fingers, two sprouting from each shoulder and thirteen toes on legs which came to an abrupt end above the knee. The fascinating and beautifully written true story, charts Rosie‘s birth into an Irish immigrant family, and leads the reader through every facet of her inspirational life. It includes her early years filled with long periods of hospitalisation and treatment; her education, employment and relationships; and onto true fulfilment of a lifetime’s desire to be independent. Illustrated throughout, the book is a remarkable testament to a strong willed daughter, wife, mother and respected businesswoman. Directly from Rosaleen for £10 per book (inclusive of postage and packing) by clicking the “Buy Now” button above. For bulk or overseas orders, please contact us to confirm delivery charges. Visit the Four Fingers and Thirteen Toes Facebook page to find out more!